OK, so I'm updating this as I'm trying to upload some photos. I tried last night too but the connection is too slow so it takes a few hours and then kicks you out at the last bit. I'm in another cafe today though but it still says 89 minutes to upload 8 photos So there will not be many as I'm not spending the last week of my trip on the Internet! We wake up in Guilin and I go downstairs to have a coffee. I'm feeling the need for a sugar fix so I ask for milk AND sugar in my coffee. The guy says I can have only milk or sugar I assume it is lost in translation but none the less cannot be bothered explaining so just opt for milk. We head out for a look around and to try and book train tickets for Guilin to Chengdu. But once again no joy. This is not apparent straight away though and it takes us 3 trips to the train station before accepting this as an answer (they just kept telling us to come back in a few hours). We are feeling pretty crap now at the thought of having to pay out for yet another flight. We try and book our train from Chengdu to Beijing but no joy there either. We give up. We head back to the hostel and decide to get out of Guilin and head to Yangshao. We pick up some street food a long the way. I get this rice wrapped in lotus leaf ( I have had in the UK and enjoy it). This one is funny, it has kidney beans or something in it. Can you guess where is goes after one mouthful........yes the bin (you're getting good at this game). We look around for a place for lunch before we leave. We find somewhere and sit down. Sally is looking a bit uncomfortable and I ask her what's wrong she says nothing. I assume like me she is finding the bright yellow table cloths a bit sickly. I can hear a chicken making a right noise and look round thinking he must be in the garden. I glance to my right side and see about 10 chickens in this cage all waiting to be killed. We leave! We find somewhere else and order crispy beef. On this menu we have the usual choice of pig stomach, dog, frog and boiled bacteria! The beef arrives and it is not crispy beef that I know of. It is not very well cooked and covered in breadcrumbs with mayonnaise lavished all over it. We don't really eat it. 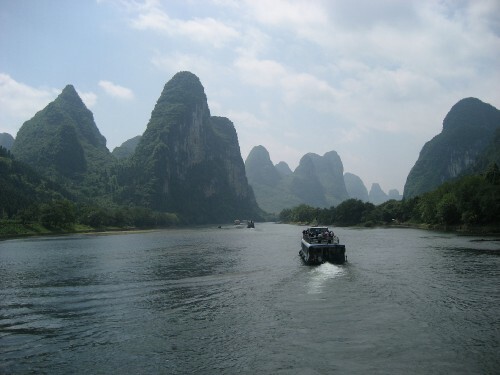 Yangshao is 1 and half hours away from Guilin by local bus. We wait at the bus station and get chatting to an American guy (who we had been saying was pretty hot as we thought he was french and could not understand us, he could understand us though ...oops).The bus journey is like a rolercoaster ride, with some very near misses. I spend some of the journey with my hand over my eyes and feeling like I was driving with all the imaginary breaking I was doing! I'm mesmerised though by the number of lemon stalls along the road, just hundreds all the way! We get to Yangshao and it isn't what we were expecting. I was expecting some quaint little village but it is actually like Kavos for the Chinese. Although it is pretty and the scenery surrounding it is pretty dramatic. We check in and wander around. Alot of the bars are playing really loud music, too loud. This night we have some simple food. Sally has lasagna and I have a burrito. We find a cafe bar and have a beer. We then head back to the hostel for an early night as tomorrow we want to get out and about.